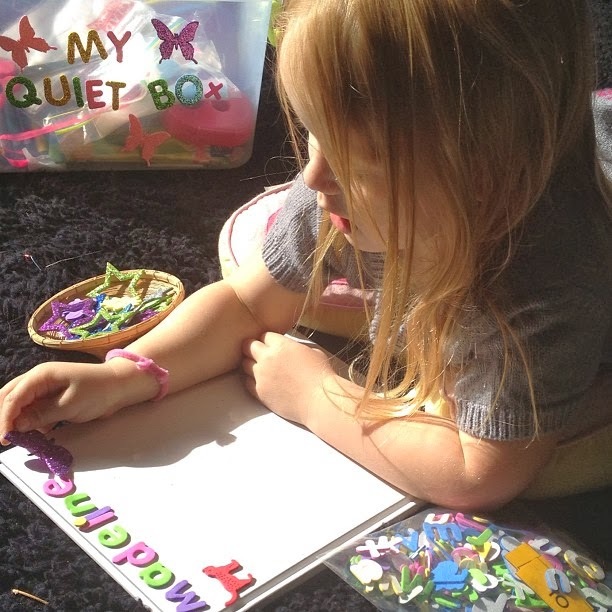 Learn with Play at Home: Enticing Literacy. DIY Writing Box for kids. Enticing Literacy. DIY Writing Box for kids. For Maddie's 5th birthday I made her a special "Writing Box." Being a teacher of the Early Years I knew that she was at the perfect age for really developing her writing skills and love of writing. She is already interested in writing, thanks to activities we've done over the years such as writing in salt, writing with water on the chalkboard and sensory name writing. You don't have to wait until your child is 5 years old though to make something like this. It should interest and engage them in writing/mark-making/drawing/creativity regardless of the age. As my daughter is just starting her first year at Primary School, I know that this means that over the year she will be expected to write and to practice things like hand-writing, letter formation, sight words, story telling, etc. My vision is that having a special way to inspire her to want to write and get excited about writing, should hopefully help in this area. 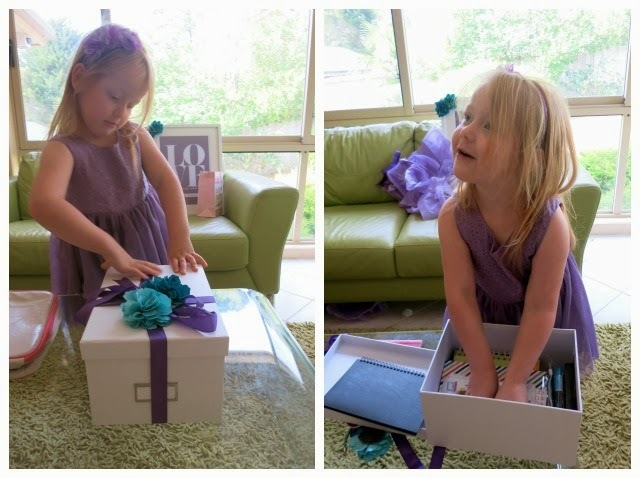 I have always tried to encourage a love of literacy in her and this was just another way that I thought would help entice her to really want to write and be creative with her own special box and materials. I based the gift around a good sized, plain, sturdy box. (I bought this one). I could have gone all out decorating the box, or buying a fancy one but I deliberately wanted to inspire her with a blank canvas. The box's surface is part of the writing and creating experience. When I told her this, she was thrilled! I filled the box with a range of different and special stationery supplies and then tied it with a ribbon and some lovely silk flowers from a broken necklace I kept. Even as she was looking through the box, she couldn't help but stop and start writing straight away when she came across this paper. Yes, success! Writing inspired already. To make a Writing Box like ours, you will need a good sturdy cardboard box that will fit all your materials. You can use a plastic tub etc. instead, but the great thing about a blank cardboard box is that it also makes a great writing and decorating surface. The fluro and metallic markers look especially great on black paper. There's something quite special about black paper as it's so different to what we're used to using all the time. I purchased all the above supplies from Micador. I bought both of the sets on the internet via google and ebay searches. I actually found it quite difficult to find really nice letter writing sets for children which I was a little surprised about. Both of these were perfect though and I was delighted when I found them and had to get them both. We have enjoyed receiving mail and making birthday cards for years and I hope this will entice her to want to write more letters to people. I wanted to include some extra materials to entice design and creativity. Paper tape is great for young children as they can tear it off easily. These materials can be used to decorate letters, the box, drawings, tape down secret notes, make your own envelopes, create words with, tell stories with and so much more. These are extra special ones compared to others that she uses on a more regular basis. What's inside our "Quiet Box"? 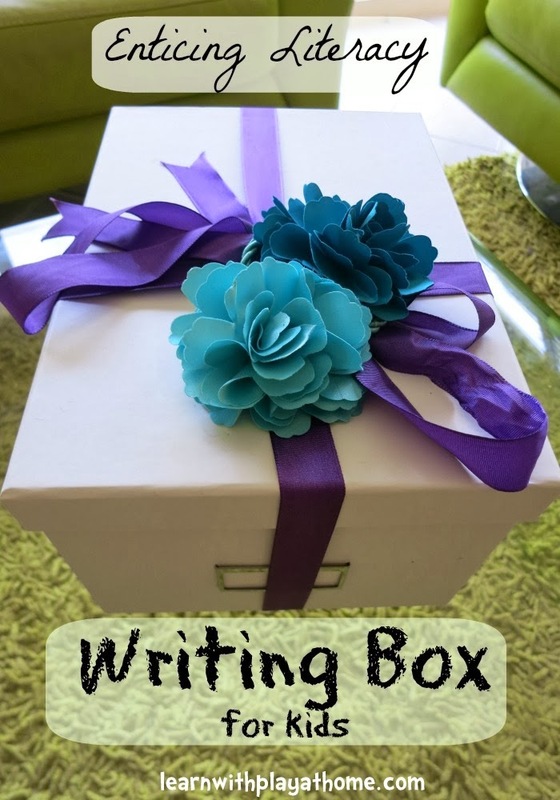 What else would you include in a "Writing Box" for your child? I really enjoyed this idea. I am always looking for ways to encourage my children to write and this is just the thing to motivate them. Thank you for sharing, great idea! Thanks :) Glad you enjoyed the idea. This is a fab idea!! my youngest are 3 and 4, and they both would love this! pinned!! I love it! She is becoming a fantastic little writer. Cant wait until my son shows some interest! That's so gorgeous, I think it would entice me into writing! Such a fun and special idea. I love all the things in that box. It would make a lovely present for a range of ages. I adore the little letters set. I bought that a while ago and forgot I had it. Miss Poss is totally ready for that now. I'll have to do up my own writing box now too! We gave something very similar to Cammy for her 4th birthday. It's a gift that lasts a life time. Do you have to make a research papers but are considering what the best way to go about it would be? Well, there are several different recommendations that you must keep in ideas when it comes to writing research records, and he has a good point are some of the top recommendations that you should implement when writing research papers.